In my last post, I discussed the potential for an extended California dry spell–largely the result of time-lagged effects from a recent split of the stratospheric polar vortex and subsequent disruption of the Northern Hemisphere flow pattern. 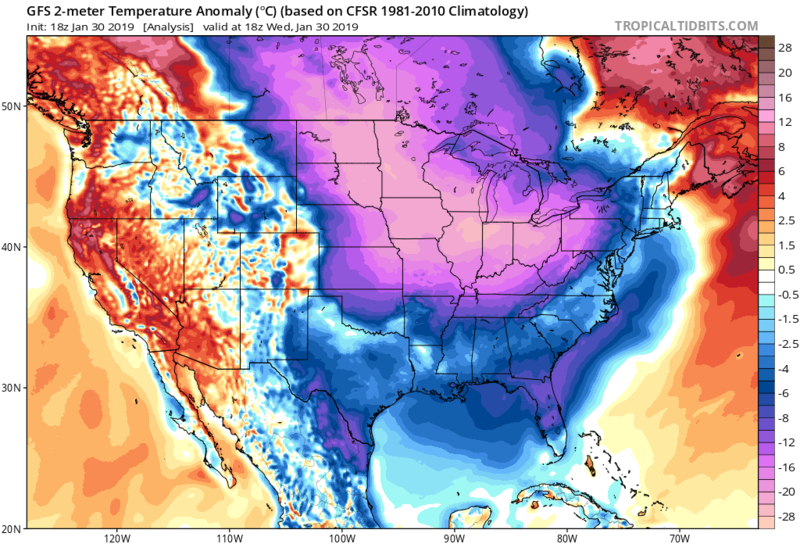 Well, a major disruption definitely occurred–and has resulted in some extremely noteworthy outcomes across the U.S. Midwest–where, against all odds in a warming world, all-time record low temperatures are being threatened this evening (with windchills as low as -70F in northern Minnesota (!!) ). Back on the West Coast, we did see two weeks of strong ridging and generally warm temperatures. But that window of dry conditions is now rapidly closing this evening as the first in a pair of significant weather systems approaches the coast. A very modest “outside slider” (i.e., sliding southeastward just west of the California coast) will bring some coastal rain from the San Francisco Bay Area (tonight) all the way down to the Mexican border (tomorrow). Rainfall will be pretty light and confined to the immediate coast in NorCal, but could be briefly heavier across SoCal tomorrow afternoon as the low makes it closer to the coast. A thunderstorm or two will also be possible, as the airmass associated with this weak system is fairly unstable. This will not be a large storm overall, but could actually bring a fairly respectable soaking to the highly populated parts of coastal SoCal. Following tomorrow’s weak system, a far more dynamically impressive system will follow on Friday/Saturday. This event will feature what now appears to be a rapidly-strengthening surface low near the North Coast. Previous experience suggests this kind of set-up has the potential to bring very strong winds to parts of Northern California. Such events are usually subject to substantial uncertainty right up to the day of the event, as the surface low needs to be pretty close to the coast and the cold front has to be sufficiently strong to mix strong winds aloft down toward the surface. Interestingly, both the GFS and ECMWF now suggest that this event could produce just such conditions–with very strong 850mb winds (in excess of 70 kts) potentially producing strong wind gusts from about the Bay Area northward on Friday evening. It’s *possible* that these winds could be stronger than those during the significant wind event earlier this month, and could be locally damaging. 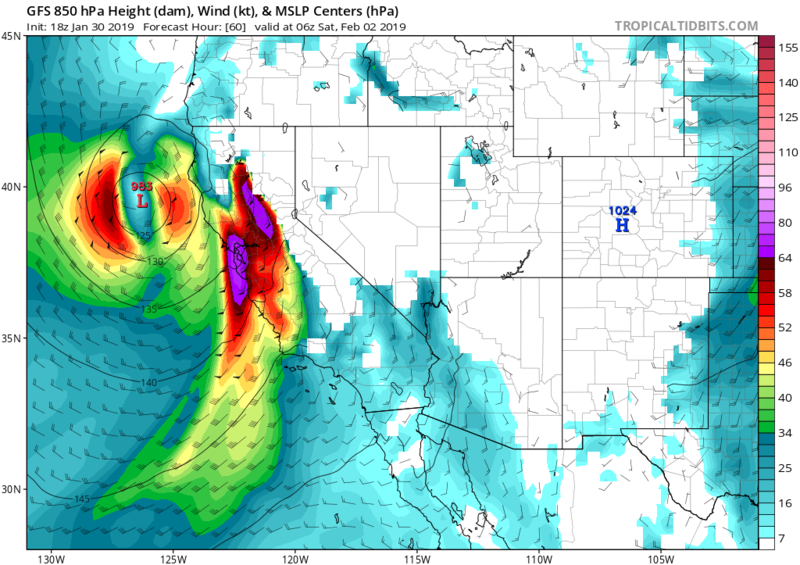 It will be worth watching the forecast over the next 48 hours to see if future model forecasts continue to suggest the potential for very strong wind gusts across parts of NorCal. In addition to a strong surface low and the possibility of damaging winds in NorCal, very strong vertical motion due to favorable jet dynamics will lead to the possibility of a rather impressive cold frontal passage. Briefly torrential downpours and thunderstorms may occur, especially in NorCal. Overall rain totals in NorCal won’t be especially high–on the order of an inch or two in most spots, but more in favored areas–so only modest hydrological issues are expected for the post part. In SoCal, winds should be much less of an issue but precipitation intensity will still be quite high as the cold front passes through. Widespread minor/urban flooding is likely on Saturday with this event, and there is at a modest chance of more significant flood/debris flow issues near recent burn scars. Very low snow levels in far NorCal? An interesting side-effect of the extreme Arctic outbreak over interior continental North America: a much less dramatic but still regionally striking lobe of continental polar air is now expected to settle southward over the Pacific Northwest early next week–bringing sub-freezing temperatures and probably some sea-level snow to Washington and Oregon. Recent model forecasts (including from both the GFS and ECMWF) are suggesting at least some potential for this very cold air to edge southward into far northern California by Monday/Tuesday. In fact, both models are currently suggesting the potential for accumulating snowfall well below 2000 feet elevation along the North Coast and across the northern Sacramento Valley. (Right now, these models are suggesting the potential for snow not only in Redding, but even near sea level along the coast near in Eureka/Arcata). 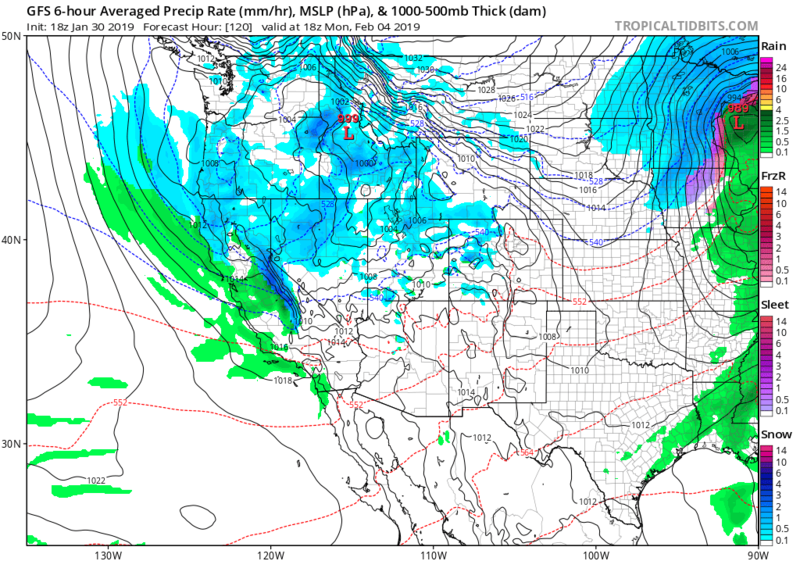 This cold air will not make it very far south in California–mostly staying north of the Bay Area–but this has the potential to be a rather unusual/interesting event for the northernmost reaches of the state. 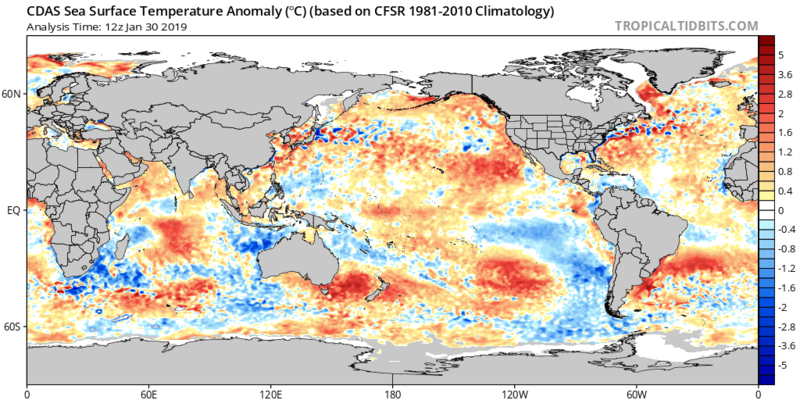 El Nino update: meh (for now). The (very) short version: the Pacific Ocean sure is warm. But that warmth is not localized to the tropical eastern Pacific–it remains much more diffuse, and if anything appears to be concentrated in the subtropics. Thus, the traditional atmospheric teleconnections associated with El Nino teleconnections are not really in place. Coupled ocean-atmosphere models continue to indicate the eventual development of more sustained ENSO conditions in the coming months, which is a bit reminiscent of the false starts prior to the big 2015-16 El Nino event. While it’s too early to say whether a similar situation will evolve over the next 6-12 months, it would certainly be interesting if the models once again latched onto the development of a significant event one year too early. Time will tell!